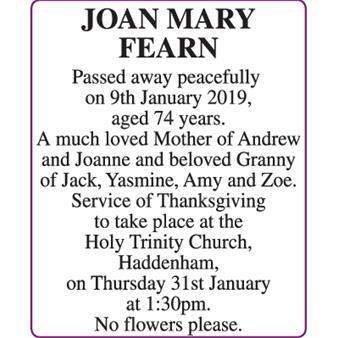 JOAN MARY FEARN Passed away peacefully on 9th January 2019, aged 74 years. 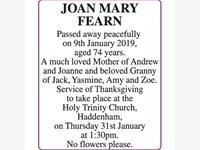 A much loved Mother of Andrew and Joanne and beloved Granny of Jack, Yasmine, Amy and Zoe. Service of Thanksgiving to take place at the Holy Trinity Church, Haddenham, on Thursday 31st January at 1:30pm. No flowers please.